The YI Cloud Home Camera packs way too many great features to cost just $55 on Amazon. 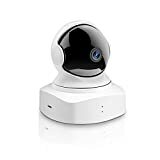 It supports everything a normal home security camera would have like 1080p support, motion detection, two-way audio, cloud storage, and night vision. But it also packs some awesome features most of the popular features out there don’t have, such as the ability pan, tilt, and zoom remotely with the awesome YI app on any smartphone. It’s a great value at $55, but use the coupon code V4RP5K24 at checkout and you’ll only pay $47.99. 1080P Full HD and 360°Complete Coverage: 108°wide-angle advanced glass lens combined with 345°horizontal & 115°vertical rotation range create a complete 360°coverage. Advanced night vision extend the viewing distance to 3m in pitch dark with no light pollution, protect your baby or pet from disturbance of LED glare. Controlling on Mobile: 1080p HD live stream direct to your smartphone. Reliable Wi-Fi connectivity to access your camera with YI Home App on mobile device(ios or Android) for controlling and viewing at anytime, anywhere. Customize your IP camera settings via intuitive app, also supports connectivity to more devices with the same app/account for maximum convenience. Real-time Activity Alerts: Receive real-time Activity Alerts whenever motion is detected and sends 10s motion tracking records and centers the moving object. Excellent Protection of Data: YI Cloud support to avoid the risk of losing important recording footages from a SD card, provide the most efficient compression, ensure all your videos are safe and protected. Supercharged Two-Way Audio: YI Cloud Dome Camera Hands-free Mode allows for a flexible 2-way conversation with your loved ones, wherever you are. Intercom Mode support you activate the microphone and speaker, then you can send commands to your pet or scare off unwanted guests.